(from left to right): Stedman Bailey, Tavon Austin, Jared Cook, Chris Givens and Kenny Britt expressed their solidarity with activists protesting against the no indictment ruling in favor of Ferguson police officer who killed 18-year-old Michael Brown. Photo by Huffington Post. As a long-time sportswriter and columnist, one thing I have never done in print or cyberspace is openly express my fandom for a particular team, especially those I cover on a regular basis. But last Sunday I became a fan of five members of the St. Louis Rams—Stedman Bailey, Tavon Austin, Jared Cook, Chris Givens and Kenny Britt, not so much for what they did on the field in a 52-0 shutout of the Oakland Raiders, but for what they did before the game. As they came out of the tunnel to begin the game, Bailey, Austin, Cook, Givens and Britt displayed, “the hands up, don’t shoot” gesture made popular during in Ferguson, Missouri during demonstrations protesting the decision of a St. Louis County Grand Jury not to indict former Ferguson Police Officer Darren Wilson in the shooting death of Michael Brown. Britt and rookie running back Tre Mason also performed the gesture during the game after scoring touchdowns. Rams fans at Edward Jones Dome in St. Louis express their views about the decision not to indict Darren Wilson, the police officer who shot and killed Michel Brown in Ferguson, Mo. Photo by CBS local in St. Louis. Black men, whether they be athletes or a sports writers, recognize that any of us can be victims of violence at the hands of police officers in the same way Brown, Oscar Grant, Eric Garner, and Tamir Rice, the 12-year-old who was recently shot to death in Cleveland while wielding a toy gun- were killed by the cops. But usually, athletes tend to stay on the sidelines while others take to the streets in protest of yet another instance of the missive “There’s no justice, there’s just-us”. The possibility of lost endorsements, lost prestige and lost contract dollars tends to be their first thought. In the tradition of Tommie Smith and John Carlos’ Black Power salute at the 1968 Summer Olympics, the players decided to use their place on the NFL stage to highlight just how big a problem police brutality is, and how important it is to solve it. While the Police Association acknowledged the player’s First Amendment rights, they also threatened to mount a protest of their own against the League. To their credit, the NFL refused to bow down to the schoolyard bullies of the Police Association and discipline the players for exercising their First Amendment rights. I guess that Roger Goodell is too busy dealing with domestic violence and child abuse to add “attempting to change the Constitution because some cop’s feelings got hurt” to his to-do list. But my question to the St. Louis Police Officer Association is what’s next? Will they threaten the thousands of protestors every time they point out an injustice by the cops? 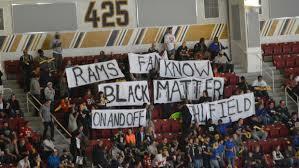 Will they racially profile the Rams’ Black players or refuse to provide security at future Rams games because someone dared to take a stand against the problem of police shooting unarmed Black men? You would think in this time of heightened tensions between the African-American community and law enforcement that the St. Louis Police Officers Association would be coming up with ways to build better relationships with people of color. But all this did was reinforce the deep mistrust that many African Americans already had of the police. While it wasn’t new, the Rams pre-game protest was refreshing in a day and age where prominent athletes shy away from anything controversial. With their silent gesture, they spoke volumes.